It is so easy and fast to create a website from scratch. If you’ve never done it before, watch the video below. It is so much easier than you think! Hello. David here from mybesthostingreview.com, and this video is a quick start guide for creating a website from scratch. I don’t have a domain, nothing. I don’t have a hosting account, and I’m pretty sure I can get something up real quick. I think the limiting factor is actually how fast A2 System automatically sets it up, which sometimes is nearly instantaneous and other times there’s a queue, and so it can take maybe like an hour or so. At least right now, I’m on my let’s see, the URL, mybesthostingreview.com/best-hosting-company-favorite/. I’ll usually have a link here in the sidebar. You click on that, and you click on A2 hosting. And I’m going to create a new one, we’re going to go to; so you want to do shared hosting and click here. And I’m just going to do hosting versus hosting dot net. Alright, so another kind of hosting comparison site. Alright, it’s available. I already knew that. Okay, so I’m gonna do twelve months, even though for three years, seventy-one dollars is really good, because the price does go up after the second year. But I’m just gonna do this right here. So, we’re not gonna select this. You know, you might want to select this, if this is a serious website, if you plan on taking shopping cart stuff then you might want to do that, but no I don’t need that. This is kind of silly because their support is already so good. Let’s choose, this is fine, USA. Nope, definitely don’t want that. Let’s encrypt? Railgun, no, no. You don’t really need anything else. So thirty-five dollars, that’s a pretty good deal. Let’s go ahead and continue. No, we don’t want any more add-ons. Almost, almost had that checked. Fifty dollars. What was the domain registration? Huh, I thought, sometimes it comes with free registration, maybe it’s because their a, the coupon is so far off. This is still a really, a really good deal. I wonder if this has, comes with, oh ID protection. Yes, we definitely want that. We don’t want any spammers, or anything on that sort. Add to cart. Continue. Okay, so sixty dollars, and actually almost half of it is the domain registration. And I think you get. There’s some way to get a free domain, but I think with such a deep coupon, where you’re getting like seventy dollars off. That you don’t, you don’t get a free domain registration. I think that when you pay this annually, you should get a free domain. I bet if you message them, they would give it to you. Okay, so we are gonna check out. Let’s see. Use default contact. Add new contact. Okay, I’m gonna fill this out. I’m gonna pause this real quick. One quick tip on a, making a password. The security. I never trust these passwords strength estimators. Really when you want to do a password, you want it to be as long possible. I basically just mash the keyboard, and make sure I have a, characters, upper case and lower case, and numbers. And really a, twenty As is more secure, then a seven random characters. Because, with each additional character, it becomes exponentially more difficult. So, that’s a really quick tip. Or, if you really want to remember the password. I copy and paste it somewhere else. If you want to remember the password. Smash together like three or four words, that normally, would be, not not go together pretty, very commonly. So that’s a quick tip there. Okay, so I’ve filled out the credit card information, and I clicked order, and then I’ve ordered. And, so I actually had to change. I wanted to, I didn’t want them to think that I had used my own. Cause that’s a, this is an affiliate link, when you click on this, I do get some credit. I didn’t want them thinking that I’m trying to, you know, get my own. Get credit for my own account. So, I went back and they wouldn’t let me use the same one. So, I got a slightly different domain. So, it looks like there’s already a C panel login. So, we can login here. Oh, this is great. Okay. And, so we’re gonna install Word Press. Install. And I’m not gonna do the [inaudible 00:04:47]. I’m just gonna do [inaudible 00:04:49]. And we’re just gonna do posting versus posting. Oh wait. No, we want this directory to be blank. Posting. Host company comparisons. Okay. I’m gonna put in a user name and password, and I don’t want to show it in this video. Okay, so I went ahead and put that in, and I’ve got an email. I’m gonna show you how to set up and email it. Again, really quick. This is the beauty of C panel. I’ve got advanced. I do like to do automatic backups once a month. And let’s go ahead and do two. And then we click, install. Alright, and this is actually really quick. Okay, so we want to go ahead. This happens all the time, it’s I don’t. Oops. Hopefully we can edit out that password or I’ll change it. Let’s install again. I’m just gonna let the clock get ticking. Oh, notice I’m at six minutes and we. Oh, it’s got a unique. I’m going to go ahead and copy this. Cause that’s a unique login. Which is secure. It looks like they installed something, but actually let’s just click through to here. So this, the site is not up yet. It takes some time for the domain registration and everything to come through. So, be come through I mean propagate the internet. So, Word Press is actually installed. And at this point, we’ve spent really probably less then ten minutes of time, and we’ve already got a Word Press site up. So, what I’m gonna do is I’m gonna pause this video, and then I would recommend you go do something else for a little bit. Maybe just wait to the end of the night or something, and then wait till the next day. But notice again, we’ve bought a domain. We’ve bought hosting. We’ve gone into the C panel, and we have done, and we’ve installed Word Press. All in less than ten minutes. Actually, let’s go back here and I’m gonna show you how to do the, the email. So, we’re gonna set up an email. [inaudible 00:07:27] If you can’t find it, you just go “email.” Email accounts. So we’re just gonna do contact. I’m gonna do generate, but I’m gonna pause, cause I don’t want someone hacking my email. Okay, that took all of ten seconds. I’ve created this. And if you want to set up an email client, you can do that. Another thing that I often do. We’d go back here, and you type in “Forward.” If you want, what you can do is you can add a domain forwarder. So, we’ve got contact at and then put like your main email address there. I went ahead and did that so it’s going to my personnel account. So, now I don’t need to, I can put this email in wherever I want. Let’s see if, the. [Background awww] So, again this is not to do with A2 hosting. This has more to do with like the internet as a whole, and it propagating. And that’s really the limitation here. And if it weren’t for that, we’d be able to get in and do some basic things with Word Press. Which, I’m going to show in the video. Again, this is eight and a half minutes from start to finish, and we are most of the way through a simple set up of a website. Again, this is so easy, and this is part of why. Let’s go back to. Let’s see. Let’s go back to. Why I love the C panel. You see how fast we did that. There’s some advance things that you can do in here, but just email address and Word Press. That’s pretty much all you’ll ever need. You can ignore everything else in here. There’s some other things that you can do, especially if you do hire a website technician. Which I’m gonna talk about in a minute. So, I’m gonna pause this and I’m gonna come back to it later. And we will take a look at, once the website propagates. I’ll take a look. I’ll show you the back end and some of the simple things you can do. It’s really not, not as bad as you think. And it’s very very simple to get a simple set up, and to start actually building content on the internet. Okay, this is part two of a quick website set up, uh, guide, and it’s the next day. And the site is up and running, and you can see here. I’m at hostingversushosting.com and you know, I probably could have just waited. Gone and done something else for twenty minutes and then come back, and it would have been fine. Or an hour tops, under most circumstances. But, here we are in the next day, and it’s pretty simple with Word Press. Just go slash wdadmin to login. I’m gonna pause while I login. Okay, I have logged in for the first time. You’ve got a lot of stuff going on. If you’ve never done Word Press, don’t worry. It’s actually pretty simple. There’s a lot of stuff you can ignore, but another important point here is that we never really need to go back into the hosting account. Other than to like manage billing. That’s the good thing about Word Press. So all that C panel stuff, you don’t really need to, need to use it. I’m gonna go ahead and dismiss these things. A lot of times, I’ll go in here and I’ll see kinda what plug-ins, and I’ll disable any plug-ins that are already enabled. But the plug-ins are what enable you to do a lot of things really quickly and easily. You can also go into the themes and there are tons and tons of free themes. So, at this point, let’s say. Alright, let’s say we really like. Okay, we really like this one. Alright, so we’re just gonna go install. Activate. I’m gonna hold control and I’m gonna click on this, so we can keep this open. And you can see, I’ve essentially got a site up now. And now all you gotta do is add content, which is, you know, I say. All you’ve got to do, that is a, a significant portion of what you’d be working on, but at the same time, in about ten minutes of work, we’ve gone from having no website, no domain. We [inaudible 00:11:15] bought a domain, to having bought a domain, and having a basic website up. And there are lots of paid plug-ins. Paid themes that you can get. And those tend to be pretty inexpensive. I think that you can get some pretty good themes for anywhere between twenty and one hundred dollars. That will enable you to, give you more options in terms of your design. I personally don’t like themes that kinda make, make this small post right here. I should be able to go into here. So we’re right, you know, I can customize, and if I had like a different image; I’m sure I could. Let’s see. Logo. [inaudible 00:11:57] You do a logo here, and a header image. I could change this. I could remove the image. Let’s go ahead if we do hide image, you can see what it looks like. I’m not gonna save it. Just cause I want to keep that right there for now. Let’s, we can go look at some additional themes. Personally I, the twenty seventeen theme is actually not bad. I kind of like it. So, I’m gonna go ahead and activate that one. And I’m gonna customize the, these are default free themes. Again, and there’s some really good paid themes, and also if you want to hire someone to. If you want to hire someone to create a custom theme for you, or to edit and clean up a paid theme or a free theme for you, that’s really not that expensive, when compared to other websites. Because, it’s so easy to find someone. To find someone to edit Word Press, because it’s the most common content management system, or CMS. Okay, and so, what I would do if you really wanted someone. If you really a newbie, at managing a website, you can still do a lot in here by yourself. Just watch, there’s a bunch of Word Press tutorials in an hour, you can know the vast majority [inaudible 00:13:21] of the basics of adding content to where you need to add it. But what you can also do, is you can go to ofwork.com, this is where I would normally go to find someone. This is how I found my long term contractors, who I call my website technicians. They’re not. I separate graphic designers from website technicians. You could also find graphic designers here. I would probably start with a logo. You can hire someone, maybe even on like fiver.com. I wouldn’t do any, anything other than like graphic design with fiver. But, there’s, uh, you can buy logo design. A lot of these, I do have an account. But I’m not gonna login. Actually, here. Let’s login. Okay, so I’m logged in. We go to graphic design, logo design. This is probably where I would start, if you really are gonna outsource some of this. You can find logos. Fifteen dollars, you know, five dollars, is you know, which is how this website started. It used to be where people could get logos for five dollars. It’s gonna be pretty hard. So, lets check this guy out. I want. You want somebody with a lot of ratings. And you wanna really read, cause sometimes, you know, the basic. So you kinda, you probably do want the high resolution [inaudible 00:14:37] and it’s a hundred dollars to get the source file. That’s pretty expensive. I think you can probably find one where you can get the source file. That’s pretty important, for the long term. You know, viability of your business. But, also if you’re just getting started out and you’re trying, uh, go on a budget. Still, just getting the, the basic logo is gonna get you a long way. You can always come back and have it redesigned, you know, a year or two later if things are going really well. You can also probably get website. Web and mobile design. Let’s check that out. So we might want to search, let’s just search the page for Word Press. And we’ll create a Word Press website design. Alright, so. And, you know, read different things here. I mean a hundred and sixty dollars is not bad, for getting a legit web design. I mean, it used to be thousands of dollars. I mean this is a premium one. He’s got good reviews. This gig has, it’s only got ten reviews. So I’d probably look for one that had a little bit more. But it’s hard to find. A lot of these. You have ta look around on here. I don’t use this all that often. But this is another way to get things designed. You know, if you’re not a graphic designer. But let’s say, you’re making a blog. You wanna make a blog post. You can just go in here, and it’s just simple. This is a new blog post. Content, content, content, more. Click publish. And we go here, and [inaudible 00:16:20] I have to set it up right now. This is a new blog post. See how easy that was. And then there’s also pages that you can create. I’m not gonna go into all the different ways to create this, but the point is that at again in about ten or twelve minutes of work, we got a brand new site. Brand new domain, that didn’t exist twenty-four hours ago up and running, and ready for you to put your mark on it. Ready for you to add your own creativity. Another important thing here. Similar to the themes, is there’s a lot of free plug-ins. You can go, plug-ins, and you can go featured and popular. Anti-spam, that’s not bad. Popular contact form seven. This is one I use a lot. I like that. Lot of people like to use this even, and it has a bunch a good reviews. I never use it. I do a lot of SCO and really it’s not, it’s not really that important to me. There’s a bunch of, it’s a bunch of fluff in my opinion. Woo Commerce is okay, for if you’re doing E-Commerce. All-in-One SCO pack is very similar to Yost. I mean in the point here, is that, a lot of this stuff is free. And really simple SSL [inaudible 00:17:28], if you have an SSL certificate. A security certificate purchased through your hosting company, you can set it up. This is the final step. Once they get it setup. So all these free plug-ins, like a lot of this stuff would’ve cost you hundreds of dollars if not thousands of dollars to get a web designer or web developer to do it for a non, a website that doesn’t have content management system. Okay, and so that’s one of the beauties of Word Press. There’s also just like, just like there’s paid themes, there’s also paid plug-ins. There’s a lot of good paid plug-ins. Honestly though, you probably want to keep these light. Contact form seven is probably the best one that I saw on there, that you’re gonna want. It makes it real easy to have contact page, or contact us in different places. And again, this video isn’t meant to be like an all the things you could do with Word Press. It’s just sort of like a quick getting started with a website. Again, this is a brand new website. Hostingversushosting.com, did not exist twenty-four hours ago, super important. And, you know, I hopefully, this demystifies for lot of people. I don’t have a website, I don’t know how to get started. Will, this is a really, you know got. You can get started in, and again ten to fifteen minutes of work. Now, if you like this video. Ten to twelve minutes. If you like this video please, please click the thumbs up. Please subscribe, and I appreciate you watching. Let me know if you have any questions. You know, submit whatever questions you want. If you have any, if there’s any specific recommendations, or you’ve started this and you’re having an issue; go ahead and make a comment. Or shoot me a message, and we’ll go from there. Thanks. Have a great day. Bye. 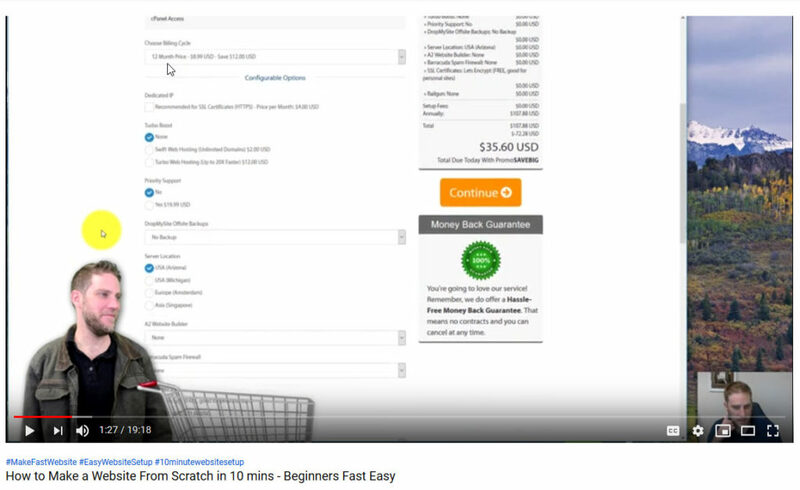 The post How to Create a Website from Scratch FAST (10 minutes) appeared first on My Best Hosting Review. What are my picks for the top hosting companies for 2019? My picks are unorthodox because I look at things from a very practical perspective. For example, a lot of hosting reviews talk about “uptime” — which is ridiculous. There’s no effective difference between 99.95% and 99.92% uptime, but they will rate companies on this. As long as their uptime is reasonable, it is all the same. Hello, David at mybesthostingreview.com. This video’s about the top three hosting companies for 2019. I have used over 100 hosting companies and this is my culmination of all that testing after building thousands of websites. The right hosting company can make your life so much smoother, to where you pretty much don’t know that they’re there. And when you do have to interact with them, it goes easy. And even with bad hosting companies, a lot of times, you don’t have to interact with them very often but when you do, it can be a huge pain. I have, with the wrong hosting company, I have lost over $50,000, a big, big client because they messed up really big, and it made me look really, really bad. Big lesson learned there. So here are my judgment criteria. Number one, and if you’ve seen my other videos, which I recommend you check out, not owned by EIG. This is Endurance International Group. Okay, this is a company that they buy other hosting companies and then they strip their support in order to be more profitable, and as a result the quality of the hosting goes down. It’s not just the support but that’s the most obvious example. For example, I was a long time Bluehost customer many years ago before EIG bought them. And they were bought by EIG and immediately the support just fell off of a cliff. Not only that, but the quality of the product, I was paying for really expensive, like dedicated server which I thought was like, “Oh this is safe to use for a big client.” And it just wasn’t. And the support was just terrible once I switched over, and doing more research I found out, oh this a common thing. And so you can come here and if they’re on here. I’m not sure this is a completely full list but it is a list and I try to avoid them. Although sometimes I still test these out. There can be some differences. It’s not like they merge every single company into one. So there can be some differences but if they’re on here, I would definitely avoid them. There’s plenty of other good hosting companies now owned by this company that I do not like. I do not make a moral judgment on them, it’s more just from a consumer standpoint, I would never recommend them. Okay so they also need what I would call a true cPanel. I don’t know why companies do this and especially a lot of companies that had cPanels, true cPanels that moved to sort of their own version of the cPanel, and they call it a cPanel. But this is a critical factor to quickly and easily moving forward with the things that you need to do from a hosting standpoint. A really good cPanel makes it so that you don’t need like a high level of technical experience to do some really important technical things from a hosting and website standpoint. So this is what a true cPanel looks like. This is a more up-to-date skin. There are some older skins, let me see if I can find one for you. This is the most modern one. Here’s what an older one looks like and it’s really the same exact thing, they just made it look a little prettier and more modern. This is totally fine, this has everything you need, it’s very quick and easy to use. It means that it’s easier to hire someone to make changes to your hosting account and a lot of times, there’s some really simple things that you’d be surprised you can do with a good true cPanel. And one thing that you typically get when you have a company with a true cPanel is you get one or more SQL databases and then a quick WordPress install. You need to have at least one SQL database in order to install WordPress. And then there’s just like one click, you fill out a couple of things, you basically give a title to your site and give some access information and then you can install WordPress very quickly, which I highly recommend. All of these companies will have excellent support and not be massively overpriced. Actually I want to go back to the support thing, this is something that is one of the biggest problems with the EIG. 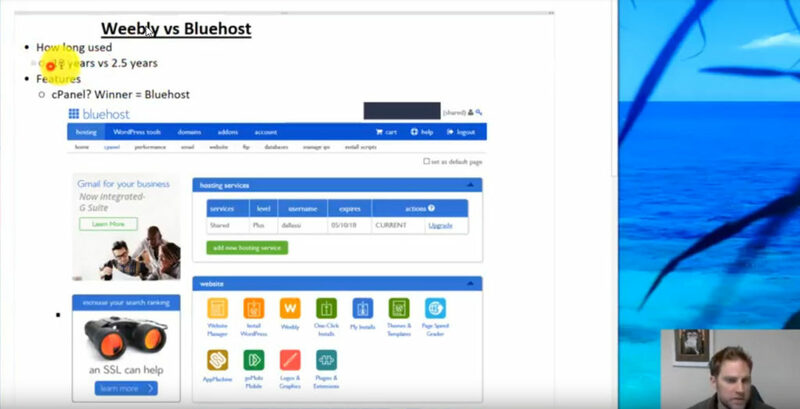 Their support, it’s just the difference between, with Bluehost, with before and after, and the difference with other companies is … It’s just very noticeable. And not only that, but EIG also raises the prices, that they really try to squeeze every dollar out of all the customers they currently have. And I don’t like that. I mean, there’s so many hosting companies out there that you can get for a reasonable price. That to pay a lot of the EIG companies that try to charge you about $180 a year which is outrageous, that the posting better be awesome. It would be one thing if that $180 dollars provided excellent support and was awesome in so many other ways. Even then, I wouldn’t want to pay for it, the most I’d want to pay it. For really good hosting, it’s probably about 100-$120. While you can get it cheaper, it’s not always about getting it cheaper. That’s per year so that’s still pretty inexpensive. Okay so let’s move into number three: Namecheap. So I really like Namecheap, I use them a lot. They’re one of my favorites and have been for a long time. They’re not owned by EIG, they have a classic true cPanel, they have databases in WordPress and they’re actually the least expensive of these. But while their support is good, I don’t like the way they have their support set up. They don’t use a ticketing system, at least not in the way that I like it. It’s more either chat or phone, and I prefer to be a little like submit a ticket and come back to it later. I don’t really like doing chat and I also don’t like making a phone call. And so that is my problem with them. But at the same time if you’re looking for a really cheap host, that has all the things you really need, go with Namecheap. They’re quite excellent, I just can’t complain about them. Other than using their support, which I don’t usually have to. Number two is SiteGround. I really like SiteGround; they’re not owned by EIG, last I checked at the shooting of this video. They have a cPanel, they have databases, they have WordPress, they have excellent support, they’re gonna be a bit more expensive than Namecheap. But I think it’s worth it. Again this is a pretty close call I think. They’re kind of different. I do prefer SiteGround if it’s a really important website, I would choose SiteGround over them; I prefer their support system. Again, it’s not like you’re gonna get really horrible support with Namecheap and really great support with SiteGround. They’re both gonna have responsive support, I just prefer the way that SiteGround support is set up. And for my top hosting company for 2019, a drum roll please. We have A2 Hosting. They check off all the boxes. I even created a nice fancy icon for this. They’re not owned by EIG, they have the cPanel, they have the databases in WordPress and quick install, they have top notch support. I have no complaints about them, every time I use them I’m totally happy. It’s fast, they check off all the boxes and then some and I have not found any downsides to them. Any issue that anybody has ever complained about with them, they have been very fast in responding to them. And I haven’t personally experienced that, any serious issues with them. So they are my number one recommendation for 2019. Let me know what company you like the most for hosting. Put it in the comments and if I haven’t checked them out, I’ll check them out. If I have, then I’ll let you know what my experiences are with them. Thanks for watching, and have a great day. Make sure to click the like or subscribe if you enjoyed this video. Thanks, bye. 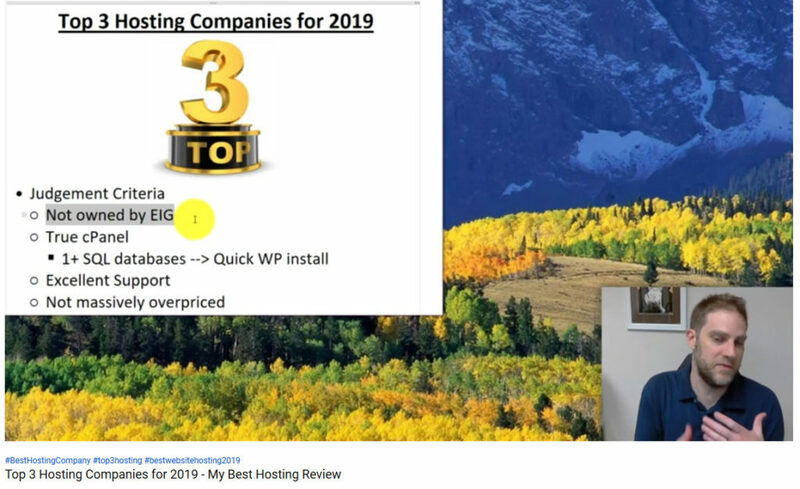 The post Top 3 Hosting Companies for 2019 appeared first on My Best Hosting Review. The post Wix vs iPage Hosting appeared first on My Best Hosting Review. Weebly and Bluehost are two of the most popular hosting companies on the internet. They also couldn’t be more different from one another. 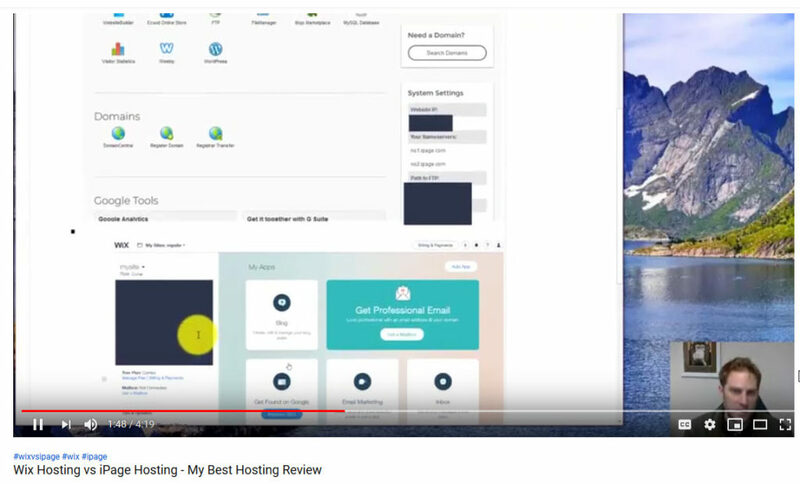 Hi David here from mybesthostingreview.com, this video is about Weebly versus Bluehost Hosting. I’ve used Bluehost for about ten years now, they’re one of the first hosts I’ve used. I’ve gone through their ownership transitions, I’m very familiar with how they work. I’ve used Weebly for about two and a half years as well, I’ve used over 100 different hosting companies, so I know all the different things that I want and the typical things that hosts do or don’t do. The number one feature I look for is what I call a “c panel” and there’s sort of faux c panels and then there’s the standard real c panel. Bluehost has a faux c panel which is why I don’t like it a whole lot, but it’s still better than what Weebly has. So this is kind of what their c panel looks like, so it’s very close to what I would see with a real c panel. Just has like a different scan and slightly different features. I don’t like when they do that it just seems kind of unnecessary. This is what a backend of Weebly looks like. It’s more like a drag and drop type feature, which in order to like get started and put up the website really quick, like if you have no experience on how to set up a website this is probably going to get you up a little bit quicker. At the same time ultimately it’s going to cost you time and energy because it’s just more work and really it’d be closer to compare this backend to WordPress, which as you can see right here you can easily install with Bluehost. WordPress is going to be much more efficient from a lot of different standpoints than Weebly. I’d say it’s a better comparison to compare Weebly to WordPress, while Weebly is a hosting company, for the most part I think what they sell is their content management system or CMS which is much more closely aligned with WordPress which is very easy to install with Bluehost which is why I like it. In terms of getting advanced things installed, or getting help from a website technician, WordPress is going to be much easier than Weebly. At the same time Weebly does have pretty good support, so they’re going to be able to help you with that, but I think overall you’re going to be able to do more for less energy, resources with WordPress and Bluehost than you’re going to be able to do with Weebly. So, WordPress compatibility … Obviously Bluehost, you can’t install WordPress on Weebly, it’s pointless. There’s no point to even consider that. WordPress is definitely the best content management system, it has it’s flaws, but they can be easily offset and by in large it has the most amount of support that you can find among someone like a professional. There’s things you can do with WordPress that maybe takes you five minutes to set up that you might have to hire a web designer, or technician and pay them many hours to get done. The support is better for Weebly, I’ll mention it’s because Bluehost was bought by EIG. EIG is a company that … And I was actually a customer of theirs before they were bought, and after they were bought. They’re a company that comes in and they buy hosting companies and they strip their support, or streamline their support to where it’s definitely worse. You get longer wait times. Their support isn’t like terrible, but it’s definitely not good. It used to be really good and they also find ways to add on to the pricing. To ding you in different ways and to find ways to increase the amount of money they could get. But by in large they just strip their support and they take extra profit from it. So the support of Weebly’s definitely going to be a lot better. Pricing offers, Bluehost I’d say it has a slight advantage. The first year’s $59 and it’s $108 every year after that. So if you go to Bluehost, this is Bluehost’s shared web hosting … So you go hosting, excuse me, shared hosting, you see 3.95 times 12 … You think you could get it for $47 in a year, but that’s not true. It’s only if you order it for three years, or more, your first year’s more like $71 after … I don’t think my calculation is actually, this used to be lower so they’ve raised this price. I used to be able to get it for $59 and it’s going to be more expensive after that and … Weebly, sorry, is $96 per year, let’s take a look at that. So you’ve got $8 paid annually, so that’s 8 times 12 is 96. I can’t remember if they still allow you to do monthly, I don’t think they allow that anymore, but their lowest paid level if you do anything lower than that they’ll put their ads on there. Displays Weebly ads which you definitely don’t want. If you have a website of any seriousness you definitely don’t want ads. It should come with a free domain … There it is, free domain, so that means the first year you register the domain it’s going to cost … So you get free domain, you get tie. Because they both basically get free domain. Overall, I think that the pricing here, assuming that this doesn’t just jack up in the second year which sometimes they … I would not be surprised if they do it … Slight edge to Bluehost for pricing. Okay EIG, Weebly is not owned by EIG last I checked, so that’s good. I don’t like EIG. Their whole business model is to buy hosting companies that are profitable and make them more profitable by stripping their support and by, in some cases, increasing their pricing. So who do I recommend? I’d recommend neither. I’m not a big fan of either one of these companies, I will put a link in the description below of my favorite company why I think they’re my favorite company if you follow that follow through on that link. I definitely recommend you do that. I don’t have a lot of big needs here, in terms of what I think needs to be there in order for a hosting company to provide the kind of support that you need and it’s not just about support, it’s about the features as well and neither one of these has a true c panel like I like it and I definitely would never recommend a company owned by Bluehost and I’m not a big fan of companies that are kind of like this. Like I had done their [inaudible] Squarespace, Squarespace is a lot like this they’re hosting and a content management system. I don’t like that. It leaves a lot of features on the table, there’s certain things you just can’t do with that. Ultimately, I think it will cost you more money, more energy, more resources to be able to do that, even though you might be able to get up a website much sooner. So click the link below and we’ll talk about the hosting company that I actually do recommend and why and go from there, thanks for watching. Let me know what you think. The post Weebly vs Bluehost Hosting Comparison appeared first on My Best Hosting Review. The post Best Web Hosting for Small Business appeared first on My Best Hosting Reviews. This is the most known web host for WordPress beginners. It is affordable and ideal for WordPress beginners. The downside with this kind of hosting is the clause that states that you have unlimited resources. This because the host places restricts the usage of your site. This is the kind of web host that allows you to have all the control of the server. This web host is the best for word press blog as it can cope with the high traffic from your WordPress blog. This is a web hosting service that specifically deals with WordPress sites. This is another best web hosting provider for your small business word press that you need to know. The post Best Web Hosting for WordPress appeared first on My Best Hosting Reviews. Real Hosting Reviews from a real person who's really tested them!